Originally from Cleveland, Ohio, Dr. Rudolph Vela received his undergraduate degree at John Carroll University. He went on to obtain his medical degree from The Ohio State University and completing his Family Practice residency at Akron General Medical Center. Dr. Vela has been an active physician at Tiffin Mercy Hospital since his arrival in Tiffin. He is a Certified Medical Office Lab Director, a Diplomat of the American Board of Family Practice. 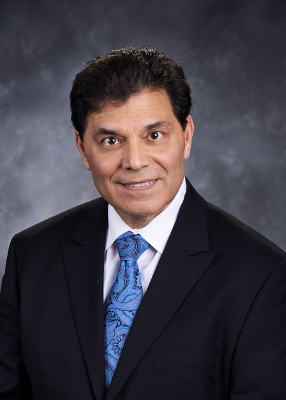 Dr. Vela is a member of The American Academy of Family Physicians, Ohio State Medical Association, Seneca County Medical Society, American College of Occupational and Environmental Medicine, American Academy of Sports Medicine, and a Physician Member of the American Running and Fitness Association. He has provided Occupational Medicine services to many local businesses, including Philips Displays Components, Whirlpool Corp., Ameriwood, Tiffin City Schools, City of Tiffin Fire and Police Departments, and NWO Occupational Medicine. Dr. Vela enjoys Marathon running events as both a participant, and consultant. He is very interested in local Cross Country High School events. His other sporting interests include golf, skiing, softball, basketball and tennis. He is an avid Cleveland sports and Ohio State sports fan. Dr. Vela also enjoys plays and concerts. Dr. Vela is married to his wife Karen, of 31 years. He has two sons, Ryan, 26 years old, and Jay, 20 years old. Both of his sons are pursuing careers in medicine.